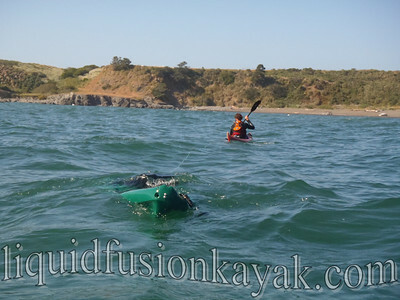 While 2 red flags flew above the US Coast Guard Station in Noyo Harbor, a green sit on top kayak bounced and bobbed beneath the surface of the water. Around 2:30 a phone call came in about a sunken kayak in Noyo Bay. It was an office day for me. I was in a stupor of paperwork and bookkeeping and didn't know how to respond so I gave them Jeff's cell phone number. An hour later, Jeff walks into our home office and starts assembling his dive gear and kayak rescue kit. 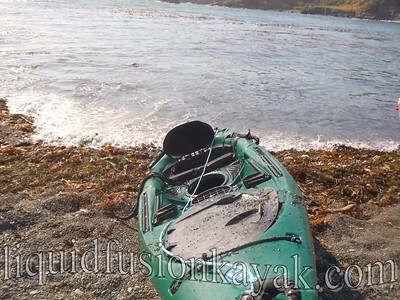 I couldn't let him have all the fun so I wrapped up my office work, grabbed my kayak and gear and headed out to catch up with him in the Noyo Bay. As I drove down the hill past the US Coast Guard Station, I noticed 2 red flags flying indicating a small craft advisory and rough sea conditions. A glance out at the ocean, it showed steep seas pitching the buoys sideways. The tide was high and waves were breaking over many of our favorite rock garden play spots. When we arrived, Scott (the guy who had sunk his kayak) had an entourage of family and friends waiting to see what we would do. He had quite an adventure already - sinking his kayak and being rescued by the Coast Guard. They had called the local diver who does subsurface repair and salvage work, but he wasn't going out due to the conditions. They expected us to come out on a boat to recover the kayak and exclaimed their surprise when we started suiting up and unloading our kayaks. 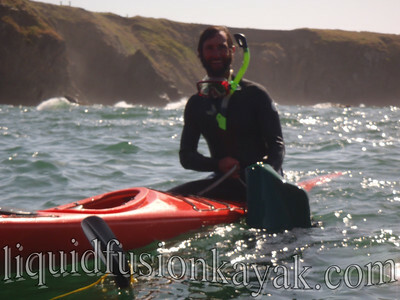 Scott borrowed his dive buddy's kayak and came to assist us with the retrieval mission. We launched and paddled out to the spot where the kayak sunk. 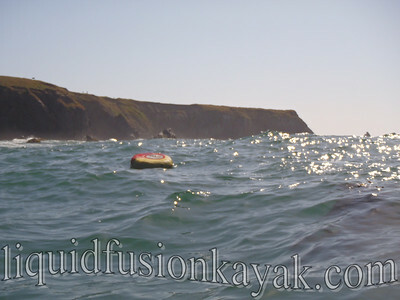 When the kayak sank, the guys cleverly tied a float tube (used for abalone diving) and anchor to the kayak to mark its position on the bottom of the bay. 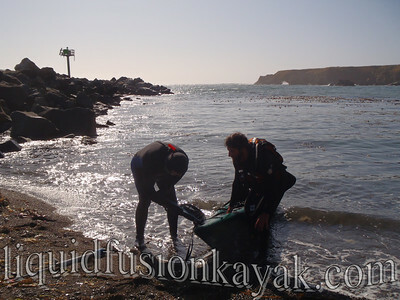 When we got to the spot, Jeff suited up with his dive gear (fins, snorkel, and weight belt). The kayak had sunk when the paddler had the front hatch open to store his weight belt and lost balance and capsized the kayak. If the weight belt had fallen out, the kayak would have been flooded but would have been neutrally buoyant. However, the weight belt slid into the bow taking her nose down into Davey Jone's Locker. Jeff dove down and assessed the situation. The bow of the boat was bouncing on top of a submerged rock about 15 feet below the rolling surface. Getting the weight belt out of the bow was going to be key in recovering the boat. Not only did Jeff get the 25 pound weight belt out of the boat, but he swam with it up to the surface. We stowed it in Scott's borrowed kayak and I braced his boat. 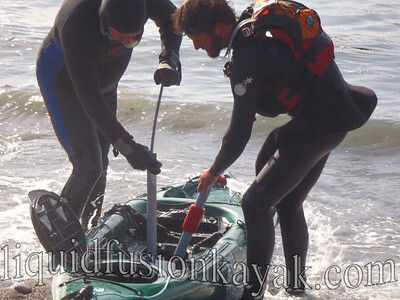 Jeff had tied a line to the sunken kayak to one of the carrying handles. I stabilized Scott's boat as he attempted to pull her up, but the handle broke. Jeff dived down and retied the line, and we successfully pulled her up. Without the weight belt, the kayak was neutrally buoyant and floated just below the surface of the water. We thought that we could bilge her out and tow her back to the beach, but her drain plug was missing and she continued to take on water. 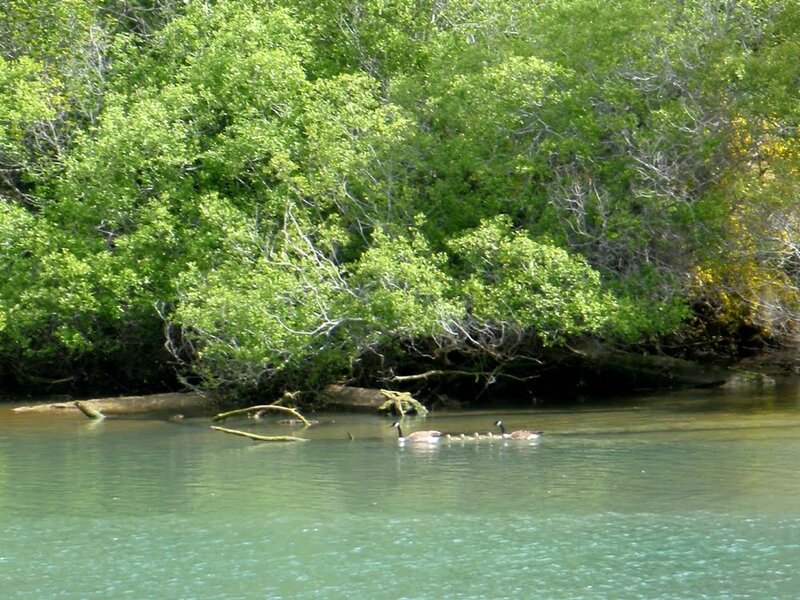 Plan B - tow the waterlogged, submerged kayak back to shore. We got her back to shore with lots of cheers. After getting the water-out, she didn't look too much worse for wear with the exception of her bow. After bouncing and bobbing on the rock for 3-4 hours, the bow was considerably banged- up but still intact. Noyo River Nazi??? I hate yelling and generally only raise my voice in dire circumstances. This week the circumstances weren't necessarily dire but here's my tale. We've been having phenomenally warm and sunny weather on the Mendocino Coast. 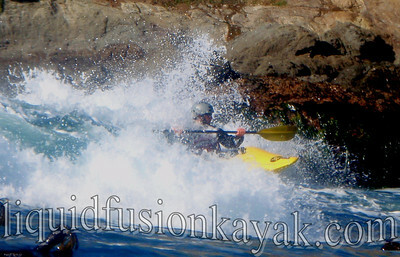 Kayaking on Fort Bragg's Noyo River has been GORGEOUS! Everything is green and blooming, and lots of different babies are starting to appear on and along the river (baby otters, merganser ducklings, fawns, kingfishers, downy woodpeckers). I enjoy watching the babies as they learn about the new world. Even the Canada Geese's goslings are intriguing. (We have mixed feelings about Canada Geese. They are beautiful but non-native breeders in our area that are starting to overpopulate and really make a mess). One of the joys of kayaking is being on the water and seeing wildlife. I emphasize to all of our renters the joys of watching wildlife from a kayak but also our responsibility to be respectful of it. This week, I was doing some equipment repairs on our deck while a few of our customers were paddling on the river. I saw a few kayaks coming down river but didn't pay much attention to them as they were not part of the LFK fleet. A few moments later, I heard tons of splashing and honking from the geese. A boy in one of the kayaks was chasing some goslings and their parents. At first, I thought he had just paddled too close trying to get a good look, but it became apparent that he was chasing them. The goslings are fairly good swimmers but can't fly and were panicked and swimming in circles while the parents honked and tried to protect them. So the River Nazi stepped up to the edge of the deck and yelled across the river, "STOP Chasing the Geese!" The boy stopped and his mom and sibling looked at me dumbfounded. 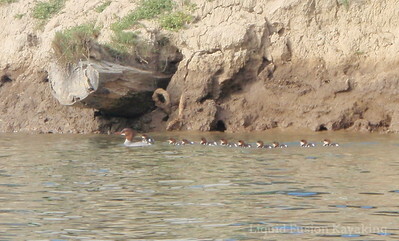 They continued on down the river toward where a group of ducks were sleeping. 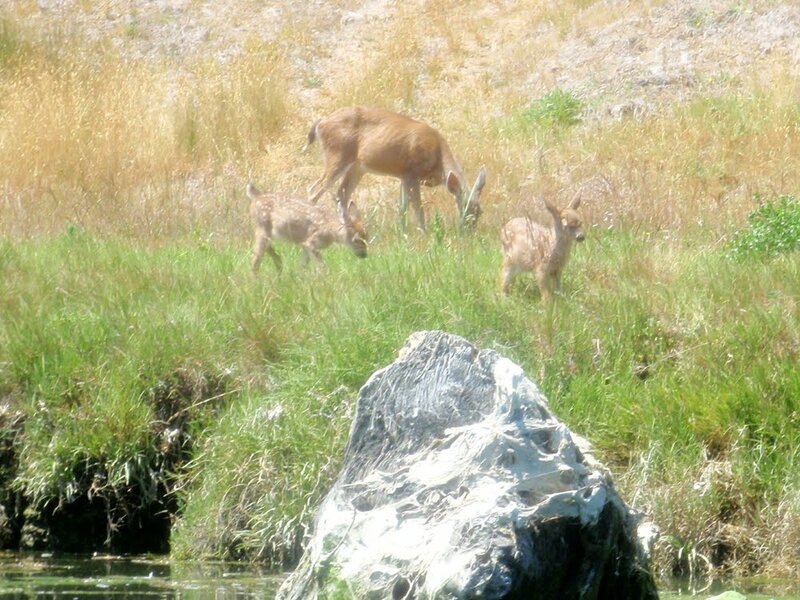 I called them over and proceeded to try to explain the need to respect wildlife especially the babies. From their expression, they either didn't get it or didn't care. I hate having to yell but felt it necessary to protect the creatures who make the Noyo River their home. I can only hope that they understood and didn't harass any more birds, harbor seals, and other creatures as they kayaked on the river. Ever wake up in the morning feeling kind of foggy? Maybe too little sleep or too much to drink - we all know that feeling. This week, I had serious fog issues with my camera. 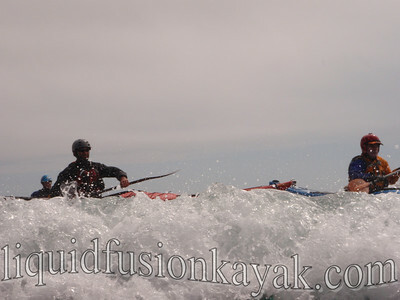 Several paddlers on our June Tour de Mendo commented about having fog issues with their cameras. I felt for them and took a moment to appreciate the reliability of our waterproof point and shoot camera. 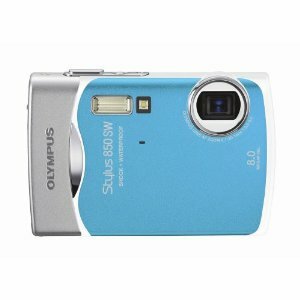 Our Olympus Stylus 850SW has been a champ. It has seen A LOT of use since we bought it in the summer of 2008 and been a solid camera for us - taking great photos and video (considering it is pre-HD). Each year, we have sent it in for refurbishing and maintenance and it has come back looking like new and working great. This week despite all precautions, it caught the "fog bug." The lens and lcd panel started fogging up. I was very disappointed as I missed some great shots but what can one do? I called Olympus yesterday and it just happens that my baby is still under warranty from last winter's repair and refurbish. They warned me that they are no longer fixing older models like this. I begged and pleaded that they bring it back to life as it is the best camera ever. Hopefully they will. Their warranty and customer service has been outstanding so I am optimistic. I didn't tell Olympus that perhaps the camera was exposed to the deadly "fog bug." Jeff had borrowed a camera from one of the paddlers in our group and it turned out to have the "fog bug" as well. He made the best out of some of his foggy photos by making them in to black and whites. Yep. Sometimes, you get to take one for the team. In last week's Tour de Mendo, I took at couple. Sometimes, it is taking one when guiding another paddler through rocks or waves and other times it is being in the impact zone for that perfect photo. I took 2 on our first day of the Tour de Mendocino. 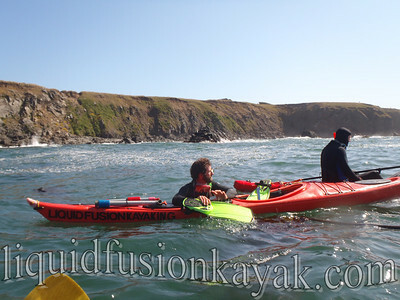 The first was guiding some sea kayakers in through a small, dumpy beach break. I had paddled in to check on a student and then turned to come back out and a larger set came in. 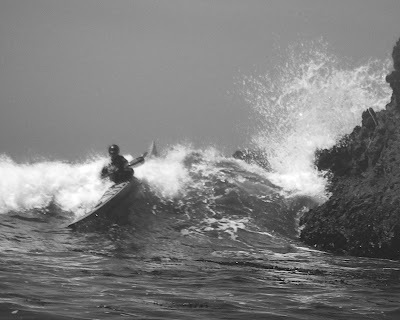 I didn't have the speed to punch through the wave and did a nice end over end. It was quite entertaining, but most importantly I guided all of my students in safely without carnage. The other was sitting in the wash zone of a pour-over. A larger wave came through and I was photographing Jeff and John coming over the pour-over together. My one handed brace wasn't enough and ker-plop I went with the camera dangling. All was well though, I got the shot and rolled up (although not one of my better photos, but sometimes its not the photo but the story). Yes, I am going to stop ranting about plastics and give my plastic kayaks a spa treatment of 303 because it is almost time for the Tour de Mendo (our June one). This year, I finally get to go. Yes!!! 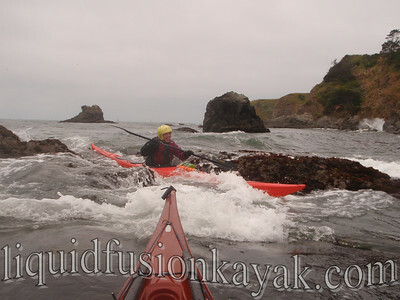 We have a sold-out trip so we are going to close the shop for 4 days and show a crew of paddlers from Southern California a great time sea kayaking on the Mendocino Coast. 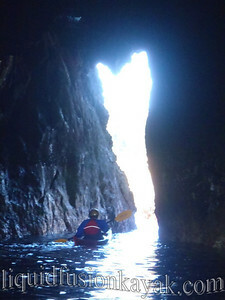 Only one member of the group has paddled here before so I can't wait to see their expressions when we paddle and play in the rock gardens and explore the sea caves and tunnels of this magical coastline. Of course we are likely to get out in whitewater kayaks for a bit of surfing and rock gardening play too. Jeff and I have a special adventure up our sleeves for this crew. Can't wait to share it but I'm not going to spill the beans now. Here's Henry . . . 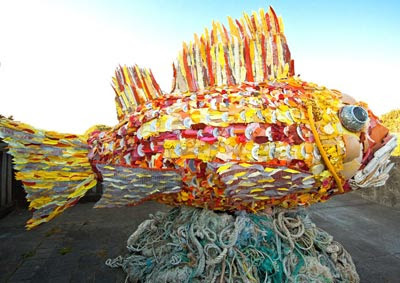 He was washed ashore - actually in the form of millions of pieces of plastic. He is going to be on display June 25- October 15, 2011 at the Marine Mammal Center in Sausalito, CA with 14 other "trashy" marine life sculptures. The exhibit is called "Washed Ashore: Plastics, Sea Life, and Art." Again - a calling for us to rethink our use of plastics. And a good excuse to visit the Marine Mammal Center.